Gog is a science-fiction film- but with a difference. Its many wonders are not projected with a view to becoming actuality in some distant millennium, but within five, or, at most, ten years from today. An Ivan Tors production filmed in Eastman color, Gog opened through United Artists release. Richard Egan, Constance Dowling and Herbert Marshall are co-starred, and the supporting cast is headed by John Wengraf, Philip Van Zandt, Valerie Vernon, Steve Roberts, Michael Fox, Marian Richman and Beverly Jocher. In addition to producing Gog Tors was also author of the original story on which Tom Taggart based his screenplay. Herbert L. Strock directed the film, and the music was composed and conducted by Harry Sukman. 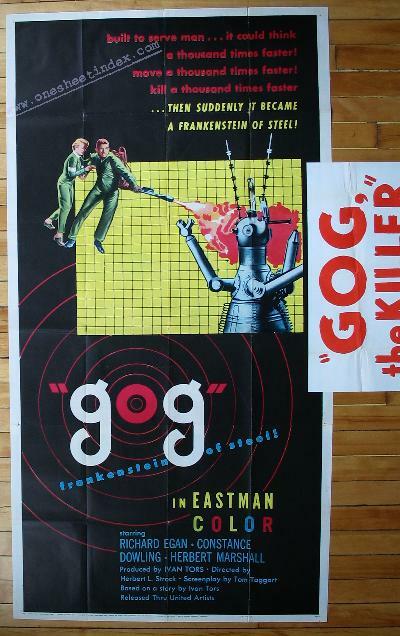 The central theme of Gog revolves around the attempts of a determined band of enemy agents to sabotage a U.S. government plan for the launching of the first platform in space, by murdering the top scientists engaged in bringing the project to reality. Gog the point is strongly made that the first nation to establish a station in space will unquestionably be unchallenged from a military point of view. The sun's rays, directed from such a station by means of giant mirrors, could destroy a city like New York in a matter of minutes, and in fact, could reduce the entire earth to ashes in a matter of a single day. in Gog They have humanoid faces and bodies, and five hands, each with a specific function-one is made so that it can turn doorknobs, another is able to handle a screwdriver, a third functions as a blow torch. In the film, the brain centers of the robots have been set so that they react to human body heat, and their mission is a fiendishly evil one. Speaking of evil, Gog introduces several entirely novel methods of murder-mostly by the application of modern scientific principles. For example, one man is burned alive by sound (ultrasonic high-frequency sound waves generate tremendous heat) ; another is trapped in a cold chamber, frozen solid and then broken into fragments; another is incinerated alive by means of the blow-torch arm of one of the robots! David Shepard (Richard Egan), security agent of the Office of Scientific Investigation, Washington, D. C., is summoned to the government's subterranean laboratory in New Mexico where 1 50 of the country's top scientists are working to construct and launch the first space station. The work is being sabotaged by an unseen enemy which strikes again and again, the lives of six scientists being snuffed out in succession. Dr. Van Ness, in charge of the installation, assigns Joanna Merritt (Constance Dowling) as Shepard's guide. She also is a security agent. Eventually, Shepard discovers that the damage and killing are being done through Gog, the giant brain machine which controls every operation in the underground plant. He also learns that the enemy agents, at the time the brain was built in a neutral company, had built into it a powerful transmitter and receiver. An enemy plane whose fiberglass body does not register on radar has been flying overhead, beaming an ultra-high frequency ray into Novac and controlling the brain.